With three days remaining until the Yamaha Australian Off-Road Championship (AORC) kicks off in Toowoomba, Queensland, the entry list for Rounds 1 & 2 has been officially released. It is with great pride that Motorcycling Australia announce that upon the close of entries over 250 entries were received. With a plethora of changes including 2018 Champions moving classes, Australian Enduro legend’s returning to the AORC fold and emerging junior talent climbing up through the ranks, the opening rounds of the 2019 AORC season are bigger than ever before! Running from 9-10 March in sunny Toowoomba, expect to see underdogs and reigning Champions go head to head as they tackle two days of Sprint formats. Over 250 riders will come from every state in Australia, (bar the Northern Territory) to be represented. Made up of world class skill, true-blue Australian sportsmanship and competitors from all across Australia, it’s time to gear up for a steamy weekend ahead! 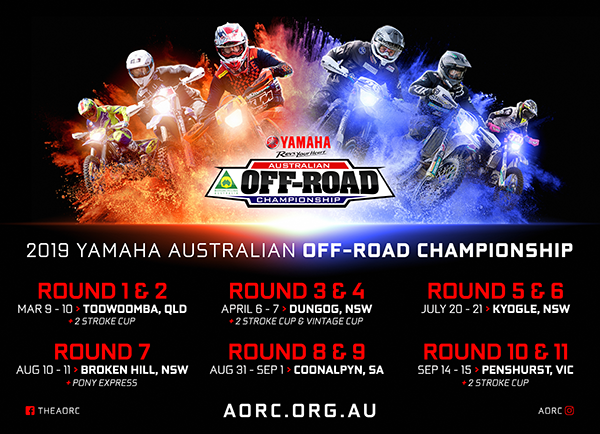 The opening rounds of the 2019 AORC season are running alongside the 2019 Queensland Enduro State Championships and hosted by the Toowoomba Motorcycle Club. You can access the full entry list here. For further information on Rounds 1 & 2 in Toowoomba, please click here.